Benedikte Gijsbregs and Barbara S. Miller. Location: Plot: G. Row: 13. Grave: 37. 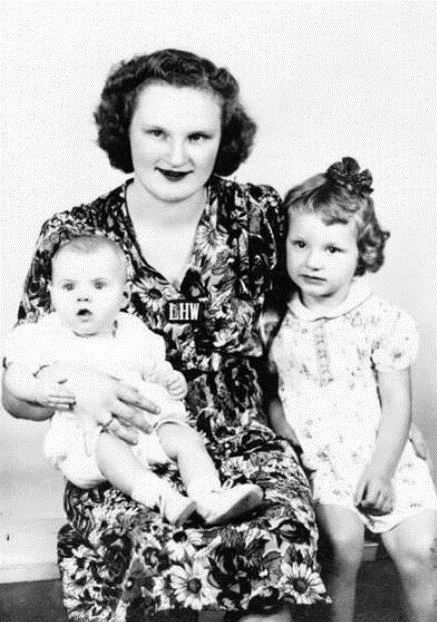 Donald's wife, Louise Helen Ward-Rush and his two daughters, Donna Sue (1940) Mary Ellen (1944) Ward. 15.11.1944 died just a few hundred meters east of Zweifall a young corporal named Donald Ward. He was like so many of his comrades buried on one of the great military cemeteries in our neighboring countries. A white cross with thousands more! But did he really died - No - he still lives - in our hearts. Benedikte Gijsbregs has adopted his grave and adjusted in many hours working his life and his last days here in Hurtgenwald! 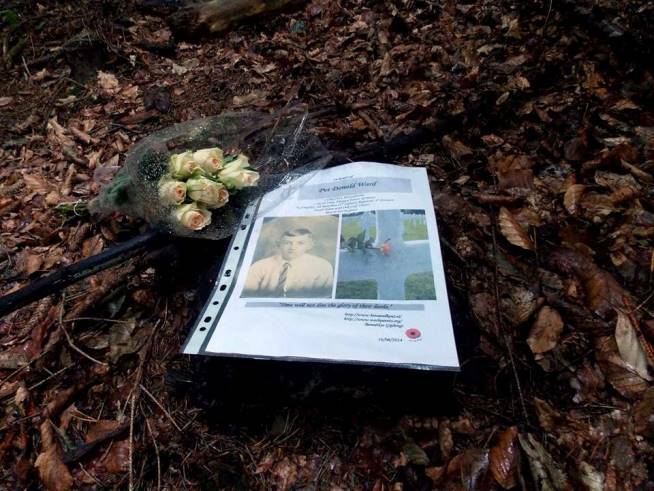 Now in his footsteps, the second more hour excursion in Hurtgenwald was yesterday carried out which has its poignant climax found by the resignation of some roses and a thank you writing on one of the sites to which this young soldier for the freedom of Europe fought! Even after 70 years this young man affects our lives and gives us poignant moments and we give in the biggest thing he after his death could want - he is not forgotten! Just as he also 24,000 other German and American soldiers have only one request to us: "Do not forget us!" In large and small moments we can make that desire! I started again with my search for family of Donald Ward. I discovered that Louise’s maiden name was "Rush" and that she was born in 1922. The eldest daughter Donna Sue was not called Ward, but Rush. The second child was named Mary Ellen Ward and there was a third child that died young (Patricia Lou Ward 1941). Louis Helen remarried (in 1948) not only with a certain McMillan (58 West Glenwood Ecorse, MI) , but she married for a third time with Mr. Walter Anthony Nikonowicz. I also know by contact with a daughter from Helen’s third marriage that the children of Donald Ward were taken away from their mother (after a mental breakdown). So Donna Sue and Mary Ellen never moved to Ecorse, Michigan. They were probably adopted by the family Rush, Ward or perhaps by the Wolfe family.... ???? Anyway, it's a complicated family matter ... but I still do not give up! Donald's grave is adopted by Benedikte Gijsbregs. A Belgian citizen who takes care of an American serviceman's grave at Henri-Chapelle Cemetery is seeking information on the World War II serviceman's background. Benedikte Gijsbregs, 44, who lives in the Dutch-speaking part of Belgium, teaches Dutch language and history. She wrote in an email that her interest in history, especially World War II, is keen. "Because I was raised by my grandparents, as a child I often heard stories about war and resistance, and that interest has steadily continued to grow," she wrote. 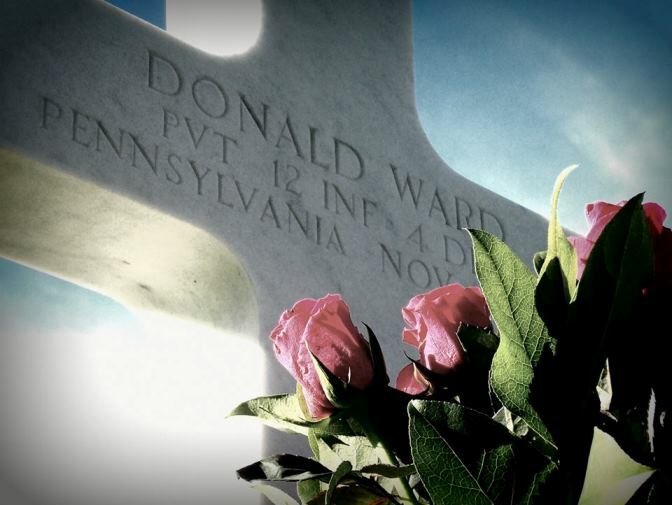 In July, through a Belgian program, she "adopted" Donald Ward's grave. "I think this is a great way to pay tribute to our liberators, to help ensure that the sacrifices they made will not be forgotten," she wrote. "I also try in my classes to make this clear to my students." A check of sources on the Internet led Gijsbregs and a friend, Ben Savelkoul of the Netherlands, to the Washington County website and, eventually, to Patricia Stavovy, Washington County assistant law librarian.From U.S. Army records, they were able to obtain an eight-digit serial number; 1913 as the year of Ward's birth; and a killed-in-action date of Nov. 16, 1944 . "Knowing more about the fallen soldiers whose graves we honor means a lot to us," Gijsbregs wrote in her email message. Stavovy put Gijsbregs and Savelkoul in touch with Janet Wareham, researcher for the Washington County Historical Society, who searched Google news archives and the Washington Reporter, finding a four-paragraph item from Dec. 8, 1944. She noted that the Ward in this news story lived in Bridgeville and Canonsburg and that his grandmother, a Mrs. John Ward, lived at that time in Washington. "Wounds Fatal to Pvt. Donald Ward," the headline read. "That Pvt. 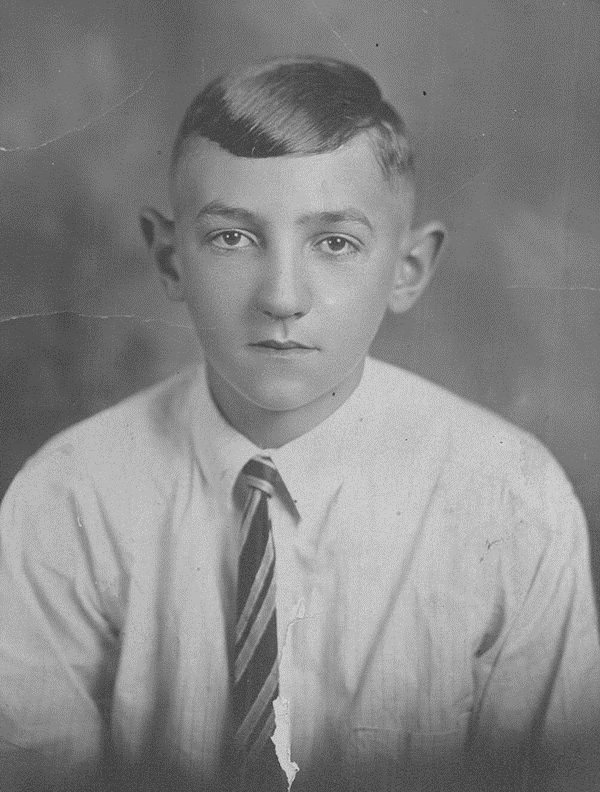 Donald Ward died of wounds sustained in action in Germany on Nov. 15 was the message received today from the War Department by his wife, Mrs. Louise Ward, of South Central Avenue, Canonsburg," the story read." Word that he had been seriously wounded on Saturday, Nov. 15, was received last Saturday. This was followed by the later telegram which stated that he died the same day. Pvt. Ward, member of an infantry unit, entered service on Dec. 18, 1943, and received his basic training at Camp Wolters, Texas. He left for overseas duty last June and had served in England, France, Belgium and Germany. Prior to entering service he was employed by Universal Cyclops Steel Corp., Bridgeville. Besides his wife, he is survived by two children, Donna Sue and Mary Ellen. "The cross marking his grave notes that Ward held the rank of private and was a member of the 12th Infantry, 4th Division. Savelkoul and Gijsbregs requested Ward's Individual Deceased Personnel File from the U.S. government, but releasing the information from World War II Army enlistment records, documenting the period from 1938 to 1946, is expected to take several months. From the file, the Europeans expect to find out Ward's last address and an address of his parents. The archives contain the records of approximately 9 million men and women who served in the U.S. Army, including the Women's Army Auxiliary Corps. "I would be so happy to have a picture of him, so I can give 'my' soldier a face," Gijsbregs wrote. "I have now twice visited his grave, and every time I asked myself how he lived, what kind of person he was, how he looked. I hope my questions will be answered some day." 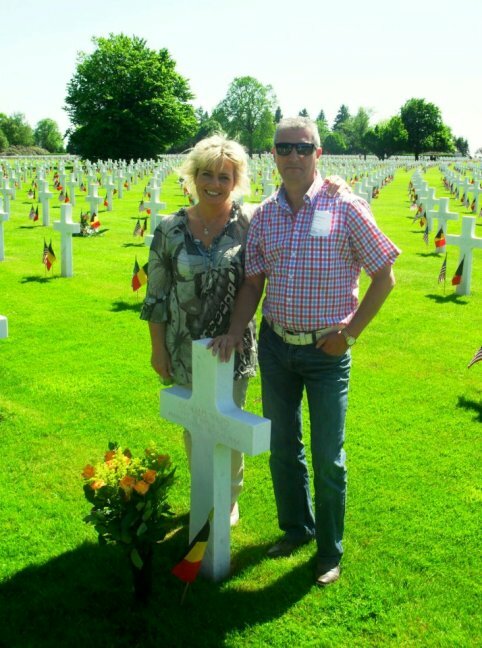 Picture: Benedikte & Ben together beside Donald Ward's grave. On Saterday May 26th finally after almost a year of e-mail contact and joint search for Donald's relatives we met each other in person on Henri-Chapelle American Military Cemetery.